Catherine Leung is a principal and co-founder of MizMaa Ventures, a Hong Kong-based investment firm that focuses exclusively on Israeli technologies. Leung formerly was vice chairman of JPMorgan Asia investment banking for 20 years until 2015, where she spearheaded efforts in Greater China. During her tenure, JPMorgan was named the best foreign investment bank in Hong Kong at various times by The Asset magazine and also FinanceAsia. She has been involved in many high-profile IPOs, mergers, acquisitions and other transactions. In this Knowledge@Wharton interview, Leung shares her views on technology, innovation and the opportunities for collaboration with Israel’s tech industry. 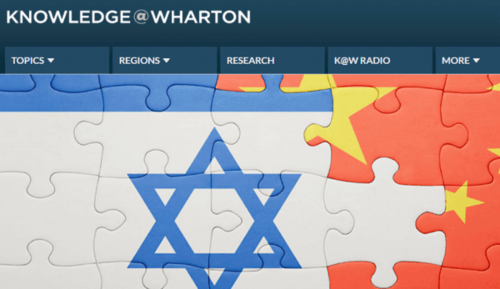 Knowledge@Wharton: Israel is well-known for its tech prowess and rich start-up culture. Hong Kong, meanwhile, is one of the world’s largest financial centers, and so it seems like the two would be a great match just on the face of it. In fact, the name of your company, MizMaa, is a combination of two Hebrew words that mean East and West. Why did you make the change from investment banking and why the focus on Israel today? Catherine Leung: You only have so long of a working life, I would say. People can say, I want to stop [working] at 50, people can say I want to stop at 60, some people don’t stop at 70, it depends on what your perspectives are, but there is going to be a limit to the work life. And I think that having done 20 years of investment banking gives me plenty of perspective, plenty of experience and plenty of scars and celebrations and victories. Where the world is now, the most interesting thing I think is actually tech. The irony is I don’t come from a tech background. I was not a tech banker. I was not an engineer. But there is a role to be played if you think of the construct you could create, and be a part of the tech scene … if there are like-minded investors who are interested in investing in some of the best technologies in the world. You alluded to Israel having a very strong prowess in tech — I would absolutely agree. There is a business to be built around tech where you can be an investor and you can absolutely put the money to work. But money, frankly, is a commodity these days. Where you make a difference in this construct is you can actually help companies grow, go to market, commercialize, bring connectivity to parts of the world where they don’t seem to have it just yet. Israel is a unique case in point whereby the tech prowess is unquestioned but technology itself is not everything. You need to be able to find an application in the technology that would change our lives for the better — where people would use it and you will become successful, in simple terms. Israel has always been very successful going to the West — to the U.S. by and large, right? [Israeli firms] find customers there, and there are many companies in the U.S. that come from Israeli roots. You’ve got Check Point, Palo Alto Networks, you’ve got the latest acquisition by Intel of Mobileye. Those are the giants … everybody knows about. It’s harder for Israel to go to the East. This is a supply and demand thing, because there needs to be interest by Israeli companies that want to go to market in the East, and there needs to be the market and the customers in the East who want to use Israeli technology. I do think there’s a very good match there because you’ve got China, where there’s a massive demand. And China itself … has done a lot of innovation and is actually ahead of the world in certain aspects like payments. … They are ahead in the world in terms of how they have innovated and transformed, and leapfrogged [some legacy payment technologies]. And China is very open to taking on board Israeli technology and then scaling that. China is not the only [big market], think about [the rest of] Asia as well — and Hong Kong is very much a big part of China. There is a thesis to be had whereby you have the money behind you, you put it to work, but you also then play a key role in adding value to your company that you invest in by bringing the customers, the market to them. Knowledge@Wharton: How do you make the business marriages between the two regions work? I see that your company specializes in cyber security, connected car technologies, fintech, artificial intelligence, machine learning and cloud technology. Leung: I would probably be too bold, frankly, if I were to go into Israel by myself. I have a partner [Isaac “Yitz” Applbaum] who has been going to Israel for the last 25 years. He is connected politically there [as senior advisor to the mayor of Jerusalem for public private partnerships]; he is connected commercially there. … He’s an entrepreneur himself and he’s been in the venture business for two decades. So, we partner up whereby I would be able to find like-minded people in the East to go in with us. But my partner is part of that ecosystem in Israel, and to some extent in the U.S. and Silicon Valley as well. He has a network to source, frankly, some of the best deals and inventions. The key is, how do you make sure that the best deals go to you? I think that’s the trick. That’s why it’s a partnership, and once we come together we basically … picked out the domains that you just talked about because we think those are the ‘unfair’ competitive advantages of Israel compared to the other technology centers in the world today, like Silicon Valley, maybe China, Canada, London. … We also talk to the local VCs, we talk to the best entrepreneurs locally, we look at the incubators. And the word gets around in terms of the kind of value add we want to bring to the table. People see the value, and you find that chemistry, and overlap. Knowledge@Wharton: Tell us a about your sources of funding. Leung: By and large, the source of funding is an investment vehicle comprised of only three LPs [limited partners]. Other than myself and my partner, the bigger contribution to the pool is one of the most prominent families in Hong Kong. And the total amount — we won’t be able to talk about, but I would say it’s a very, very substantial amount as far as early stage venture investing is concerned. Knowledge@Wharton: You have had a front-row seat to the history of China’s transformation. You were involved in one of the top investment banks in China for 20 years. What are some of the highlights you’ve seen, some of the major themes you’ve witnessed in finance but also in other areas? Leung: China learned very fast from the best practices outside of China. They take it home, they then basically find their own version of what works and they scale it up. And they do it in a way that is quite unique and forward-looking, and state-of-the-art. I admire China for that. You can see it not only in financial services … [but] in how the giants in China have taken advantage of the internet. The Alibabas, the Tencents and Baidus of the world, they are leapfrogging in fintech … they are leapfrogging in payments in Alipay and WeChat Pay. … These are giants in their own right. You can say, ‘look they started off with a model similar to the West and they took it from there.’ Maybe, I don’t know. But I think they’ve gone on in leaps and bounds with tailoring what the Chinese consumers, users, gamers need, and they’ve taken it to a completely different level. And I’m not singing the China song because I’m Chinese, I think anybody who looks at who are the internet giants in the world today would count Google, Apple, Facebook, Twitter, but they would also count Alibaba, Tencent and Baidu. They are sort of in the same club now. They’ve come about much later, but they’ve done it at a pace which was staggering. It goes back to my point — China learns very quickly, and China will take things to the next level and they will make it work for them. I do think that’s a very important takeaway for having, as you say, a front-row seat in this part of the world. I also think that a more top-down economy definitely has its benefits in the growth of China. But there’s a lot of debate about that and a complete laissez-faire [system] driven by a market economy and all that — and China being sort of [a mix of] communism, socialism with laissez-faire characteristics, right? They actually make it work for them. They manage to keep the economy growing, albeit at a slower growth pace now than 10 years ago but still growing. They managed to keep unemployment at a relatively managed and acceptable level. Monetary policy, fiscal policy — they are all as much in sync as possible. If you were to be educated in the Western world you would say: How can centralized economies be the best approach? But I do think that the hybrid here of sort of government centralized approach with sort of blossoming of the entrepreneur, and the market, and the laissez-faire, that combination is very unique in China and it actually works. The press in the West doesn’t really give China enough benefit of the doubt. Frankly, a lot of the press don’t understand China, and a lot of it is more probably a bit of … writing for sensational reporting. I do think that China has figured out a formula that actually is very unique. Russia didn’t do that, they didn’t get back in terms of the balance between laissez-faire and centralized planning. I don’t know any part of the world that can actually do that as well as China. It’s still sort of an emerging economy, it has some ways to go, so there will be growing pains. But I do think that they have the right people at the reins to make it work, given the ability to be able to plan centrally but let things blossom at the same time. Knowledge@Wharton: Where do you see the big changes over the next three to five years? Leung: China will continue a very straight trajectory of having very strong entrepreneurs that are going to come up with business models that work perfectly for China. Given the size of the market they will be big companies. And you will see in terms of the top 10 internet companies in the world, there will be more Chinese names there instead of just the three that we see today. There will be a blossoming. In things like autonomous vehicles, which I think is the next sort of iPhone, if you think about the major disruptions in the world today, you [might include] the Industrial Revolution, the invention of electricity, and then at some point the computer and the iPhone. I think autonomous cars, whether it’s car-to-car connectivity, car-to-infrastructure connectivity, or the holy grail of autonomous driving — this thing is going to take off. I think it will happen in the West first, but China will have its own version of it. We might sit back and think, how did we get here, right? We were all driving our own cars five years ago. … It’s going to be very transformational, and that’s why I think there is every bit of curiosity and drive to get into venture capital, because the innovation, the disruption is happening faster and faster, the product lifecycle is shorter and shorter, and if you could actually foresee what things would look like and what the world needs — that’s a very exciting place to be.